Authorities say one of the defendants, David Brian Stone Sr., is the leader of the militia. Assistant U.S. attorney: Group believes New World Order elitists working with U.S.
Detroit, Michigan (CNN) -- Not-guilty pleas were entered Wednesday in federal court in Detroit on behalf of eight militia members accused of plotting to kill police officers as part of a revolt against the federal government. "This is not about militias or a group of militias, but about a group conspiring against the U.S. who have shared beliefs that the New World Order elitists are in charge and seek to have one world government and is working with the U.S. government," Assistant U.S. Attorney Ronald Waterstreet said in his opening statement. "Any law enforcement officer is a foot soldier for the New World Order." None of the eight defendants spoke during the proceeding. The seven men wore orange jumpsuits and the lone woman a green jumpsuit; the legs of each were shackled. Each stood silently next to their court-appointed attorneys as the judge entered pleas of not guilty on their behalf. 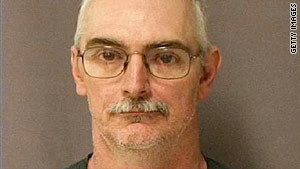 A ninth person, Thomas Piatek, 46, of Whiting, Indiana, is being held in Indiana. Most were arrested over the weekend; one was arrested Monday night. Authorities say members of the Hutaree militia planned to kill a law enforcement official. Then, according to an indictment unsealed Monday, the militia planned to attack the funeral procession to kick off its war against the U.S. government. The militia had conducted military-style training in Lenawee County, Michigan, about 35 miles northwest of Toledo, Ohio, since 2008, the indictment said. The government said its investigation began on December 8, 2008, when the Bureau of Alcohol, Tobacco Firearms and Explosives was conducting an investigation at a local federally licensed firearms dealer that the Hutaree used. The ATF's inquiry into purchases by David Brian Stone Sr., who authorities say is the group's leader, allegedly prompted Joshua John Clough, 28, of Blissfield, Michigan, to post on a militia Web site that federal agents were asking the group's dealer for paperwork. "We have and will return fire," the posting allegedly said. "The question is, will you?" The government said Stone's plan was to create his own country carved out of four Michigan counties, then defend that country against attack by the "One World Order" army. The group, according to the government, planned to incite that attack by making a false 911 complaint, shooting any police officer who responded, and then attacking funeral attendees with improvised explosive devices. The prosecutor also said militia members talked about burning the homes of the "brotherhood" -- or law enforcement officers -- and would shoot officers as they left their houses. Women and children of law enforcement officers were considered "equal targets," Waterstreet said. Much of the training allegedly involved making trip wires, developing explosives and discussing the possibility of building armor-penetrating IEDs. According to the government, the hierarchy of the group was as follows: The elder Stone, known as "Raddock," "RD," and "Captain Hutaree," served as one of two squad leaders in training exercises; his son Joshua Stone, 21, who lives with his father and his father's wife in Clayton, Michigan, was the other squad leader; his other son, David Brian Stone Jr., 19, of Adrian, Michigan, led the "opposition force" and was responsible for detonation of explosives in training exercises. Also according to the government: Tina Stone, who is the wife of David Brian Stone Sr., was in charge of communication with other militias and helped with the Hutaree Web site; Kristopher Sickles, 27, of Sandusky, Ohio, was the self-described leader of the Ohio branch of the Hutaree militia; Joshua John Clough, 28, of Blissfield, Michigan, was an information officer, responsible for maintaining the Hutaree Web site, online videos and explosives; Piatek was a "heavy gunner" responsible for laying down heavy fire during training exercises, as were Michael David Meeks, 40, of Manchester, Michigan, and Jacob Ward, 33, of Huron, Ohio. Ward and Sickles traveled from Ohio to Michigan to participate in the training exercises, the government said. About 10 relatives of the accused attended the court proceeding. The rest of the courtroom seats were filled with members of the news media. During the afternoon, U.S. District Magistrate Judge Donald Scheer held hearings to determine whether any of the eight would be released on bail. He said he would not issue any decision before Thursday. Waterstreet said the government confiscated 37 weapons -- pistols and long guns -- from a pair of trailers owned by the Stone family in Clayton, 90 minutes southwest of Detroit. Waterstreet also said Meeks at one point had a list of judges, school leaders and other officials that an undercover agent who had infiltrated the group said appeared to be a hit list. Meeks shared the list at the December 12 wedding of David Brian Stone Sr. and Tina Stone, Waterstreet said. The undercover agent helped the group's members build explosives, Waterstreet said. The group's efforts appeared less than professional at times. At one point, according to Waterstreet, Sickles told an undercover agent that he used a .357 to kill a cat "to see if I could do it, to see if I could kill something I had feelings for." At times the alleged conspirators appeared petty, with Tina Stone expressing anger to her husband about her stepson Josh not having a job. According to Waterstreet, David Brian Stone Sr. defended his son by saying he couldn't get a job because he was preparing for war. To that, he said Tina replied: "Well, I'm preparing for war, but I still have a job." On February 6, the group drove in a van from Michigan toward Kentucky to attend a meeting with members of other militias, but a snowstorm prompted them to turn back, Waterstreet said. Disappointed, David Stone Sr. decided to read the speech he had prepared to deliver at the meeting to those who were in the van. The undercover agent recorded the speech, and the government on Wednesday played in court what it said was a copy of the recording. "America is the land of the free, but every day we see another Ruby Ridge," the speaker in the recording said, referring to the Idaho site of a 1992 confrontation between federal agents and the Randy Weaver family. "They see us as little people; we need to stand up and say 'No.' "
The speaker added that the Hutaree "will fight along anyone who sees the New World Order as the enemy." "Our goal is a free nation without tyranny. We need to quit playing this game. The time to strike has come. Welcome to the new revolution," the speaker in the recording said. The only bombs built by the defendants were apparently made from cardboard tubes containing explosive material -- no shrapnel -- and used in demonstrations and training, Waterstreet said, citing videos. The bombs were built by following directions found on the Internet, Waterstreet said. The idea was to cut metal street signs and use the pieces for shrapnel, he said. During the execution of the search warrant, some street signs were confiscated from David Stone's car, but they were not cut, the government said. The government said it seized 300 pieces of evidence during the execution of a search warrant served Saturday, including firearms, explosives, bomb components and shrapnel. Michael Rataj, attorney for Tina Stone, told CNN he heard no evidence of any crime being committed. "This is going to be a free-speech case," he said. "Our client adamantly denies his involvement in any plot to overthrow the government or to use violence for any unlawful purpose," said Mark Satawa, attorney for Meeks. "He looks forward to being vindicated by the criminal justice system." David Brian Stone Sr.'s attorney, William W. Swor, said the government had shown only that his client had talked. "It's legal to speak out in America, it's legal to have opinions in America, it's legal to assemble with people in America," he told CNN. "The government has to show more than that, and if they don't, you can be sure that we'll hold them to their obligations." Federal authorities charged the nine Hutaree militia members in connection with the alleged plot on Monday. The group says on its Web site that Hutaree means "Christian warrior" and proclaims on its home page, "Preparing for the end time battles to keep the testimony of Jesus Christ alive." CNN's Drew Griffin and Shawna Shepherd contributed to this report.